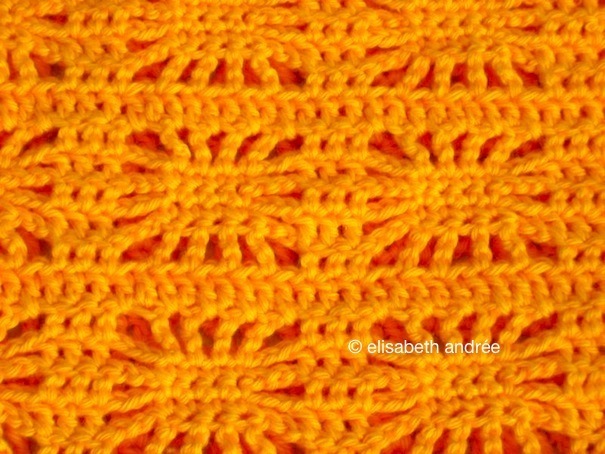 it is about four years since i’ve crochet ​​this orange bag for someone else and i have only a few pictures. fortunately i found my notes from that time. you can download the diagram of the stitch pattern yourself, you can find the link below the text. it may be that i have to remove the picture of my blog because of copyright, so please download your own. i have used a simple kind of cotton and hook size 2,5 mm. my memory fails on the number of skeins but i estimate between 4 and 6.
this is my way to calculate, but everyone will do it on his or her own way. in the diagram you can see that 1 spider is 12 stitches. that number is used for how many spiders you want, the width of your bag (or cushion cover, scarf,…). 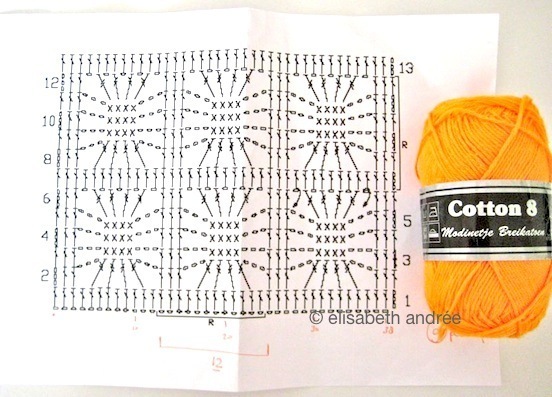 the diagram clearly indicates which rows you need to crochet in height and width to get a full spider. to avoid counting errors, i counted the chains of the diagram = 38 chains and for each extra motif, i added 12 chains. i have made ​​a total of 98 chains for each side of the bag plus 3 chains to start. the bag has 8 spiders in width and 8 spiders in height. sew the handles onto the bag. of course you can also make the handles like the handles of the doily into bag. i now prefer those because i think they are prettier and also because these handles are stronger. just measure at the top of your bag where you want the start and end points of the handles and then crochet the number of chains for the length you want (handbag or shoulderbag) and then make the number of rows to get the width you would like. this is what i can tell you about the orange spider bag, please let me know if you have questions about it. don’t know how to work with diagram yet? Categories: crochet, tutorial | Tags: bag, filet crochet, handbag, orange spider bag, tutorial | Permalink. Echt een hele leuke tas :-)GroetjesJos?? The spider pattern has to be one of my all time favorite ones to crochet! I never would have thought to make a bag with it though – it’s perfect! Thanks for sharing! wow..i love the bag so much..thanks for sharing the pattern! Hi there- found you through the Sunday Showcase hop and am a new follower. I love the color and shape! We have to bring our own bags to the market, so I would love to make this. I have posted a few fiber projects (and a new one this week). I hope you have time to follow my life in South Africa by http://withoutcomplexities.blogspot.comI hope you had a great weekend! Bouncy, Click on these links and you find all the information you need to read diagrams. Cool idea to make a sort of range. Will you send me a link to your photo’s when they are ready? About the tags: I have searched in the Netherlands to label makers and I could choose a type of label (woven) colors and fonts online. I wanted to have handmade with ElisabethAndrée on them. The labels I can sew or fasten with a sort of pin. Hope this information helps you? I’m afraid I’m having a hard time understanding what you did here. I’m not used to reading diagrams and I’m having trouble figuring out what all your symbols mean. Do you have a key by anychance? I love this and I am planning on making several. How did you make the little tag??? Do you have the written instructions on how to make your lovely orange bag?? I don’t understand the diagram. Via these links you will find all the information on working with diagrams. It is really easy. @ خياطة وتفصيل : Thanks for stopping by and for writing your comment. I have tried to post a message on your website, but I was unable. Sorry about that!